Did you know that Cornwall College is the third oldest high school in Western Jamaica behind Manning's School in Westmoreland, and Rusea's High School in Hanover? This great, boys only, high school, dates back to the 19h century when secondary education was greatly needed in the parish and George Miller, a teacher from Scotland, opened the Montego Bay Academy at the Presbyterian House, which was at the time located at 56 Union Street. In 1871, the Academy closed its doors when representatives from Scotland encouraged the Government of Jamaica to establish a Queen's College in Spanish Town. This institution also did not last long and very soon after it was again a case where the country was devoid of Government sponsored Secondary Education. In 1895, a Presbyterian Minister, Rev. Adam Thompson, and a Government representative for St. James and Trelawny, Hon. John Kerr, petitioned the Government to allocate 500 pounds for Secondary Education in Montego Bay. Hence, in 1896, the second city gave birth to Cornwall College which was at that time located on Barracks Road (site of the Public Works Office) and was called Montego Bay Government Secondary School. Mr. E. Lockett, B.A., was named the first headmaster and he served until 1903. He was succeeded by Anglican priest, Rev. George Hibbert Leader in 1904. He served some 19 years at the institution which ran into difficulties due to lack of space in the classrooms. It was then that the Hon D.H. Corinaldi stepped in and used his status to procure 2,500 pounds from the government in 1909 to assist in the provision of a new school site. Between 1910 and 1911, 34 acres of land were bought at the Pleasant Hill Estate where the institution was constructed. The school was officially opened at its new location in 1911 by the then Governor of Jamaica, Sir Sidney Oliver. In 1922, Montego Bay Government Secondary School became a name of the past and the large, beautiful institution was renamed Cornwall College. 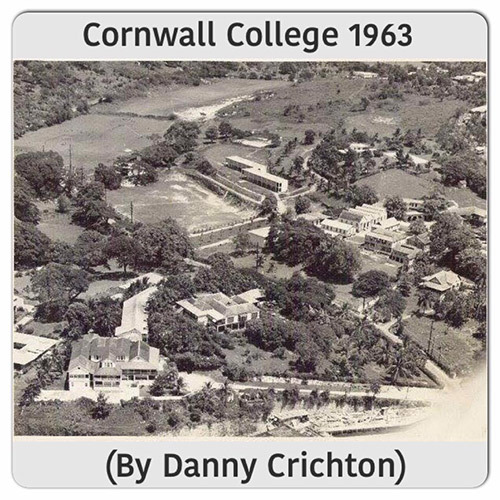 In 1953, Cornwall College came under the leadership of the first Jamaican national who set new trends and the school population expanded to over 650 boys. The institution was named the first Government school in Jamaica and also the first high school to offer Chemistry and Physics as subjects in its curriculum in the West Indies and for many years the majority of doctors and pharmacists in Jamaica were graduates of the school. The school also excelled in sports and was named the top male institution in football (soccer), holding the famous Olivier Shield over 11 times in the sporting fraternity. Upon the inception of the schoolboy daCosta Cup competition, Cornwall College also displayed their talents and skills to grab a hold of the trophy in 1953, 55, 56, 58, 59, 63, 82, 83, 95, 2000, 2001 and 2016. 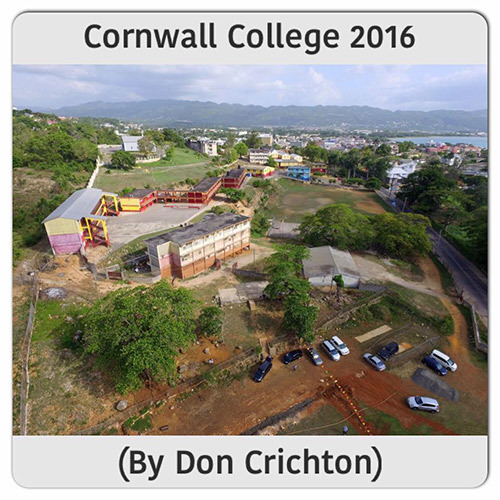 Cornwall College is now one of the top institutions in the Caribbean guide by the motto 'Learn or Leave'. It now houses some 52 classrooms and 1,245 students. The current acting principal of the institution is Mrs. Lecia Allen and she took over the helm at the start of 2017 term. The buildings are very colourful, sporting the school colours of red and gold. Many popular figures have passed through the gates of Cornwall College including Lloyd B. Smith, Chief Editor of the Western Mirror; Chief Justices Sir Rowland Phillips and Sir Herbert Duffus; Ambassador Derrick Heaven; the late Garth Taylor, Ophthalmologist; Kenneth Smith, former Chief Justice; Walt Crooks, owner of Club Inferno Resort; William Billy Craig, former Custos Rotulorum of St. James; Members of Parliament, Dr. Horace Chang, Dr. Kenneth Baugh, Dr. Karl Blythe, Lindel Frater and current member of Parliament Mr. Heroy Clarke.